RAF Church Fenton, near Selby in North Yorkshire, England. Despite RAF Church Fenton’s role during and since World War II, too little has been recorded about its rich, long and varied history (the one exception is Ian Herbert’s excellent resource). This oversight means that RAF Church Fenton’s fascinating story is much less well-known than it deserves. Our latest edition of Peter Masons ‘Fighting Church Fenton’ redresses this with personal reminiscences from those who have served there, supported with period photographs, newspaper articles and original documents illustrating the station’s long service life. You’ll also find here a wealth of material if you’re interested in our aviation past, including a comprehensive history of Church Fenton village with many unique images that aren’t available elsewhere. RAF Church Fenton was only one of the RAF’s wartime stations in easy reach of York and was close to the village the name of which was used to identify the station. Tribute is due – overdue – to all those communities where hospitality made a huge impact on the lives of both air and ground crew. Villagers and York people made it possible for family relations to live near enough to serving personnel and the village and city innkeepers gave them a warm welcome, whether for an evening or for a longer ‘escape’ from the usually bleak life of a wartime station. Bob Dales (see Article) continues: “Here were squadrons which favoured a particular inn or pub which became their ‘home from home’. An innkeeper in the centre of York, frequented by both air and ground crew of a particular bomber Squadron, told me after the war that he was used by Squadron personnel who wanted to have their cheques cashed but he never had a ‘dud’ cheque. The only losses were odd cases where airmen had not returned from operations on time for their cheques to be cleared. That was accepted as, what he called, a ‘small’ contribution to the war effort”. In March 2013, the Ministry of Defence announced that RAF Church Fenton would close by the end of the year. This time there was to be no reprieve. When this happened on 19 December 2013, the station’s 76-year history ended without any fuss or ceremony; its passing being marked only by a ‘Notice to Airmen’ issued in early December advising of the suspension of its Air Traffic Zone (ATZ) with effect from New Years Day. The Yorkshire Universities Air Squadron (YUAS), its only remaining tenants, made the short hop to RAF Linton-on-Ouse (near York) shortly before Christmas. Gloster Gladiators of 72(F) Squadron on a glorious summer’s day in 1937. Developed from the Gloster Gauntlet as a private venture, the Mk.1 was delivered in July 1936 and became operational in January 1937. The Gladiator, the first RAF fighter with an enclosed cockpit, was also the RAF’s last service biplane fighter. It had a top speed of around 257 mph yet, even as it was introduced, the design was being eclipsed by the new-generation of monoplane fighters such as the Hawker Hurricane and Supermarine Spitfire. In the 1930s, the perilous situation in Europe, particularly the rise of Nazi Germany, alerted the British government to how lax its military preparations had been between the wars. In particular, the RAF had been underfunded. New legislation in 1935 attempted to remedy this by increasing the strength of the air force. Naturally, this required new bases – including Church Fenton airfield. Plans were first announced in 1935, whereupon the local population protested that it would waste valuable farming land. Despite the protests, construction on the 260 acre-site started in early 1936. On 1 April 1937, despite work being incomplete, the station was finally declared open as a grass airfield. Later that month, Wing Commander W.E. Swann assumed charge as the first station commander. Two months later No.72 Squadron arrived with their Gloster Gladiators and No, 213 with Gloster Gauntlets. However, although construction progressed with increased urgency, the original designs weren’t fully implemented until 1939. With war looming, 1938 saw Church Fenton’s squadrons training and preparing; increasing personnel and new aircraft helped RAF Church Fenton get ready for the coming conflict. 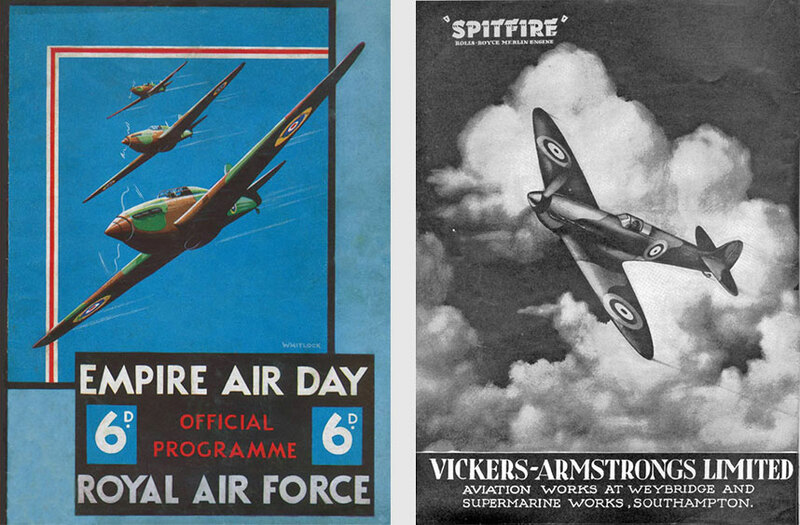 With more aircraft – such as the iconic Hawker Hurricane and Supermarine Spitfire – becoming operational, the RAF was put on a more equal footing with Luftwaffe fighters. Here, ex-RAF Church Fenton gate-guardian, Supermarine Spitfire BM597, flies over Elvington (near York) in the colours of 317 (Polish) Squadron. These markings are the originals worn during its wartime service. You can read a detailed history of this Spitfire MkVb (G-MKVB) and see unique images in ‘Fighting Church Fenton’. Luftwaffe air raids on Britain reached their peak during the Battle of Britain and represented the high-water mark of German ambitions to knock Britain out of the war by targeting industrial and population centres. Although 11 Group in Southern England bore the brunt of the attacks, squadrons defending England’s northern cities also had to be vigilant and RAF Church Fenton played a vital role. For instance, Hull’s importance as a port and industrial centre made it a principal target for air raids that claimed over 1,200 lives. Hull also holds the dubious honour of being the target for the Luftwaffe’s first daylight raid against Britain (and, later, its last raid). The Luftwaffe caused further destruction by dumping bombs and sea mines after turning back from raids on Manchester, Liverpool, Leeds and other northern targets. RAF Church Fenton played a dual role during WWII. As well as defending against Luftwaffe raids, the station had a vital role in training and outfitting squadrons for the heavy fighting in the South. In particular, the first RAF night fighter training unit was formed to counter the Luftwaffe’s NachtJagdgeschwader. Following conversion, these units harassed Luftwaffe night fighter bases and disrupted their operations by attacking them when German aircraft were at their most vulnerable – during take-off and landing. This important training role continued during preparations for D-day and after the war. Air defence remained part of the station’s mission during the immediate post-war period and the early Cold War. Although fighter squadrons were still stationed there during the 1950s, the base was destined to get a new more permanent role. In 1959, RAF Church Fenton moved from Fighter Command to Flying Training Command and continued operating for decades, primarily as a training facility. Generations of pilots learned their skills over Church Fenton, with hundreds receiving their coveted ‘wings’ there during the 1960s. 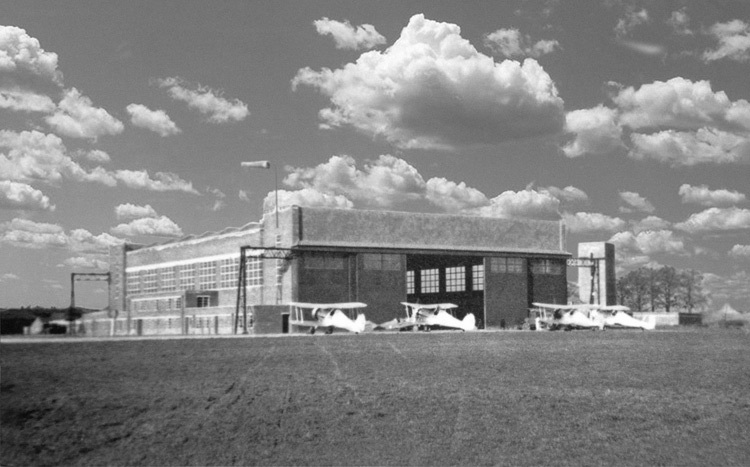 Although the station closed temporarily between 1974 and 1978, it reopened again when increasing demand for pilots required more training facilities. However, this resurgence was short-lived. In 1992 the flying training school closed, although the base remained active with a small RAF staff. Defeating Nazi Germany was an international affair, so it’s no surprise that RAF Church Fenton mirrored this. In fact, with its RAF squadrons and units of volunteers from other nations, the station was home to one of the most diverse assemblies of airmen during WWII. Particularly notable were the two Polish squadrons stationed here. The first was No.306 (Polish) Squadron, formed of remnants of Polish Air Force units from the cities of Poznan and Torun. The squadron was officially formed and equipped with Hawker Hurricanes at RAF Church Fenton in August 1940. After forming and training at the station, the squadron became fully operational and fought with distinction during the ‘Battle of Britain’, claiming 68 confirmed kills, damaging dozens more enemy aircraft and downing 59 of approximately 10,000 German V1 rockets fired at England. The other was No.307 (Polish) Squadron (the Eagle Owls of Lwów), which shot down more than 30 German aircraft. They were based at RAF Church Fenton late in the war and operated as a night fighter unit, carrying out defensive patrols and raids over occupied Europe. After leaving the station in early 1945, they flew support missions for bombing raids against German-held territory. 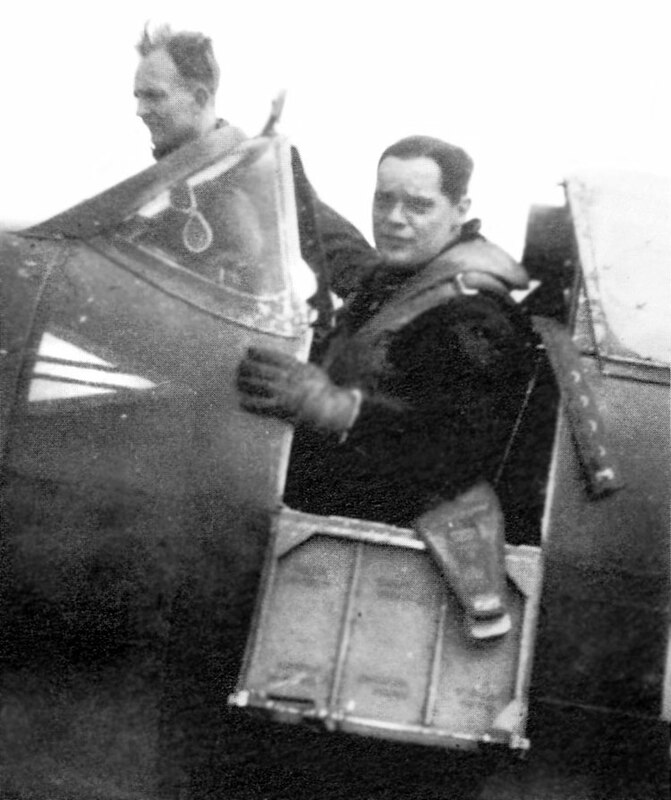 Stanisław Grodzicki, who was awarded the Distinguished Flying Cross (DFC), commanded the squadron from November 1940 to June 1944. Ironically, after surviving wartime dangers, Grodzicki died in 1946 when the Dakota he was a passenger in crashed during bad-weather near Croydon Airport. The Poles were warmly welcomed to Church Fenton with traditional Yorkshire hospitality. During one particularly cold and damp autumn, it soon became apparent that they were ill-equipped for an English winter. Accordingly Church Fenton’s women got together to collect enough wool to knit scarves for the entire squadron. Meanwhile, cut off from their homeland the Poles continued to fight alongside their allies whose language and customs they often didn’t understand or share. Polish pilots with the RAF waged a determined, ferocious, almost fanatical fight against their country’s enemy. In total, 145 Polish fighter pilots served with the RAF during the ‘Battle of Britain’ – the largest non-British contingent – and claimed 201 kills. Therefore how ironic that Poland was abandoned after the war and ‘given’ to the Soviet Union with Polish airmen playing no part in the Victory Parade of 1946, having to watch from the sidelines. To make matters even worse they couldn’t return to Poland for fear of arrest, imprisonment, torture or execution by a new communist Soviet regime that branded them traitors! Official documents, personal recollections and photographs from the era bring the conflict to life and provide a fascinating window into the daily lives of the pilots and ground crews. Poland wasn’t the only country to contribute aviators to the war effort. Even before America entered the war in 1941, Charles Sweeny, a wealthy businessman living in London, recruited American citizens to fight as a US volunteer detachment in the French Air Force (replicating the concept of the WW1 Lafayette Escadrille Squadron). After France fell in 1940, a dozen of these recruits joined American RAF volunteers travelling to Britain to support the war effort. An advertisement appeared in the New York Herald Tribune: ‘LONDON July 15: The Royal Air Force is in the market for American flyers as well as American airplanes. Experienced airmen, preferably those with at least 250 flying hours, would be welcomed by the RAF’. However, under American law, it was illegal for United States citizens to join the armed forces of foreign nations. In doing so, they lost their citizenship, although Congress passed a blanket pardon in 1944. American pilots were formed into ‘Eagle Squadrons’. One of these, No.71 Squadron, was formed at RAF Church Fenton in 1940. Initially flying the Brewster Buffalo, it quickly converted to Hurricanes – albeit in quite an unorthodox fashion! The ‘Eagle Squadrons’ fought alongside the RAF during the ‘Battle of Britain’ and afterwards, before being absorbed into the US Air Force in 1942. Of the roughly 250 Americans who had served with the Eagle Squadrons, 78 were killed while serving with the RAF and 16 became prisoners of war with a further 29 killed after their transfer to the USAAF and 18 captured. It’s still not certain how many Americans served in the RAF during the Battle of Britain, because some gave their nationality as Canadian and remained as such on official records. On the left is Andy Mamedoff from Miami, who earned his living by barnstorming his own aircraft. 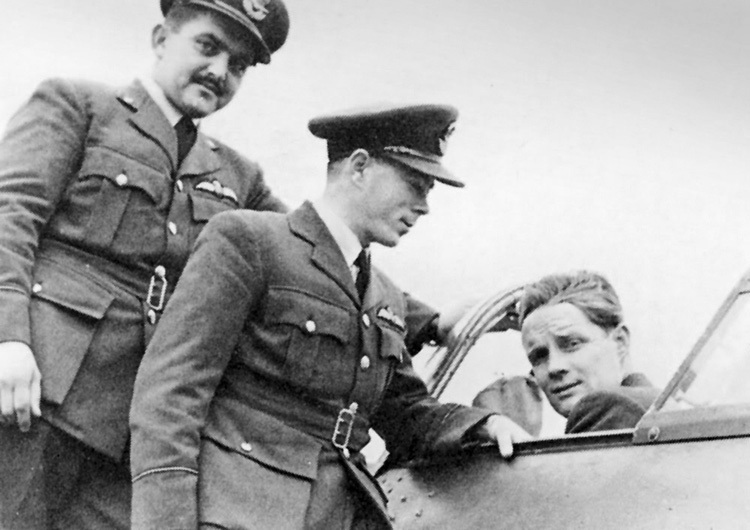 In the centre is Vernon Charles ‘Shorty’ Keough, who got his nickname by being, at under five-feet tall, the RAF’s shortest pilot. He was later lost while patrolling over the east coast and his body was never recovered. In the cockpit is Eugene Quimby ‘Red’ Tobin, who’d been a studio messenger at MGM before the war. All three men were killed in 1941 on RAF flying operations –aged 29, 29 and 24 respectively. Canadian fliers fought in the RAF too and 242 Squadron (originally a coastal reconnaissance unit in World War I) was reformed at RAF Church Fenton in October 1939 equipped with Blenheim Mk.1F’s. Like the ‘Eagle Squadrons’, 242 replacing its original Fairey Battles with the Hawker Hurricane in February 1940. Known not only for its Canadian composition but for its colourful commander, a certain DRS Bader, the squadron fought in the ‘Battle of Britain’ before redeploying to the Far East in 1941. Although the RAF only recognises 83 Canadian pilots as flying on fighter operations during the ‘Battle of Britain’, the RCAF claims the actual figure was over 100, of which 23 died with 30 more killed later in the war. As the war ended, more Allied pilots left their mark at RAF Church Fenton when No.456 (Australian) Squadron arrived with their de Havilland Mosquitoes. So it was that volunteers from many nations fought alongside these RAF squadrons based at RAF Church Fenton. This, combined with the station’s wartime role in training and preparation, explains the dozens of other units that passed through during the war and took away memories of it and its community. It also explains the diversity of aircraft types based there at this time. Although pilots are usually presented as the ‘Battle of Britain’s’ heroes, their success depended on tireless work by dedicated, highly-trained ground crews. Their stories, alongside the pilots’, give another fascinating view of daily life in the wartime RAF. Few people realise that, as well as around 50,000 aircrew killed in action, some other 8000 men and women died at home during training: due to handling vast quantities of bombs under incredibly dangerous conditions; driving and dispatch riding in the blackout on urgent duty; and deaths from what were called ‘natural causes’. Past station commanders and other well known individuals have contributed memoirs giving an intimate view of station life from those who lived and worked there. RAF Church Fenton was home to a wide variety of aircraft, both during and after the war. 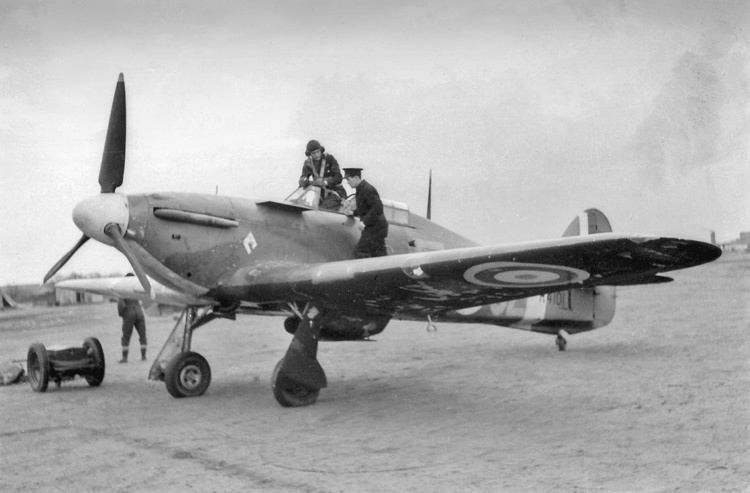 From pre-war aircraft like Gloster Gladiators and Hawker Furies, most squadrons quickly converted to new aircraft including Hurricanes and Spitfires. 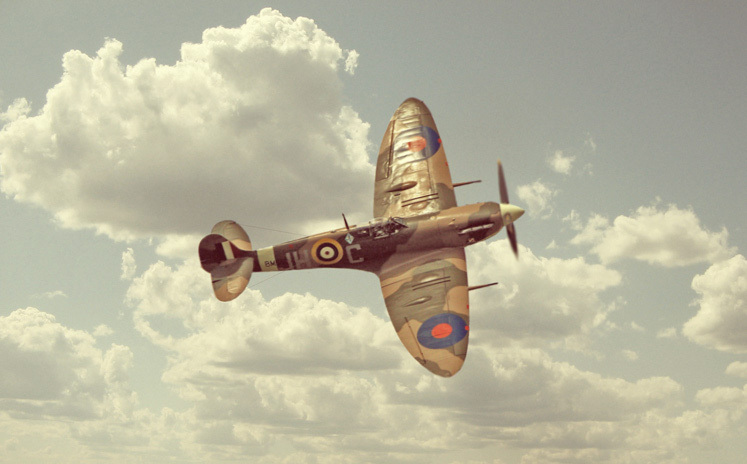 Although the Spitfire arguably became the iconic WWII fighter, the Hurricane was equally well-regarded – if not more so – by aircrews (and groundcrews) for its dependability, manoeuvrability and firepower. Indeed, during the ‘Battle of Britain’, Hurricanes achieved nearly 60% of the RAF’s air victories compared with 42% by Spitfires! Squadrons based at RAF Church Fenton flew both aircraft types; 1940 was the year they proved their worth as a vital part of the homeland air defence system that permanently thwarted Hitler’s invasion plans. Later in the war, RAF Church Fenton’s aircraft included the Bristol Beaufighter, one of WWII’s most effective night fighters; by the end of the war some 70 RAF pilots had become aces in them. The de Havilland Mosquito, arguably WWII’s outstanding fighter-bomber, was also based here. Less successful was the unwieldy Vultee Vengeance, an American dive-bomber which presented unusual challenges for pilots (a number of fatal accidents were due to incorrect dive procedures and centre-of-gravity problems). As Allied ground forces prepared to invade Europe, a squadron of Hawker Typhoon ground-attack fighters was also deployed at the station. Efficient co-ordination between air and ground forces was one of the Allies’ major tactical advantages against the Germans. After WWII, RAF Church Fenton maintained its leading training position in introducing pilots to new aircraft. The Gloster Meteor, the RAF’s first jet fighter, first appeared here in 1946, making the station one of the first RAF bases with an operational jet squadron. This period was arguably the Station’s ‘Golden Age’. In 1959 RAF Church Fenton was transferred to Training Command though under-utilised until 1962 when No. 7 Flying Training School (FTS) equipped with Hunting Jet Provosts were deployed there. In 1966, as part of the package of Defence cuts, the station was disbanded which just left the de Havilland Chipmunks of the Primary Flying School and Leeds UAS. It came as no surprise when the Station closed for the first time in 1972, reverting to a Relief Landing Ground (RLG) for RAF Linton-on-Ouse 15 miles north of Church Fenton. Meteor and other jet squadrons were based there throughout the 1950s, before Hunting Percival Jet Provost T3s and T4s became the standard for pilot instruction during the 1960s. These versatile aircraft remained at the base – apart from briefly between 1974 and 1978 – until they were replaced by Short Tucano T1s in 1987. The Tucano’s arrival gave Church Fenton another claim to fame as the first station to receive the new turboprop-powered basic fast-jet trainers. Although Church Fenton was primarily a military base; it also played an important role in the life of surrounding communities. Open Days at the base began soon after it opened in 1938 – 3,000 visitors turned out in the rain to see the first Empire Day display. The 1939 open day was one of the public’s first opportunities to see the new Supermarine Spitfire in action, an appearance described as a ‘Demonstration of Speed by Spitfire Aircraft – Three Spitfire aircraft will dive over the aerodrome to demonstrate the speed at which modern fighter aircraft now travel. Afterwards No.72 (F) Squadron will land by Sections of three aircraft’. These displays helped build connections between the RAF and local civilians, with tens of thousands attending annually until the last event in 1994. In the early 1950s, the station commander (the top New Zealand ace, Group Captain Colin Falkland Gray DSO, DFC** with 27 aerial kills, two shared-destroyed and six probable kills) allowed a local hunt to use part of the station. Although the huntsmen and women knew which areas they had to avoid, their dogs failed to comprehend the instructions, disobeyed his explicit orders and dashed across the airfield in front of landing aircraft. He was not best pleased! The station’s engagement with the community is also reflected in its long association with the Yorkshire Universities Air Squadron (YUAS). One of the UK’s largest university air squadrons, YUAS was based at RAF Church Fenton in the late 1960s, moved away in 1975, and then returned in 1995. Equipped with Grob Tutors, YUAS offered valuable flying training and experience to both students and air cadets. Sadly, this association with RAF Church Fenton ended with the station’s closure in 2013. Over the years, RAF Church Fenton has been a defensive base, a respite for battle-weary airmen and a training school – often at the same time. For decades, its people and aircraft have provided a welcome and recognisable part of the local landscape. ‘Fighting Church Fenton’ draws on historical documents, reminiscences of former station personnel, photographs of aircraft in action and other sources to vividly portray the changing shape of this historic site. These sources, many unavailable elsewhere, gives an opportunity to experience the living history of a unique RAF airfield. The Grob Tutor on the Church Fenton apron. Since 2006, UAS students are no longer taught Elementary Flying Training (EFT); instead, they follow an unassessed flying syllabus similar to EFT. Depending on their ability, they then progress to more advanced training. The Tutor is also used to give air experience flights to Air Training Corps (ATC) cadets. If you have any photographs, old cine film from the 60s or 70s, DVD footage or interesting stories relating to this particular station and would like to share them please get in touch – I’d be delighted to hear from you. This website is not affiliated, associated, authorized, endorsed by, or in any way officially connected with the Royal Air Force or the Ministry Of Defence, or any of their family of sites or any of their subsidiaries or affiliates.